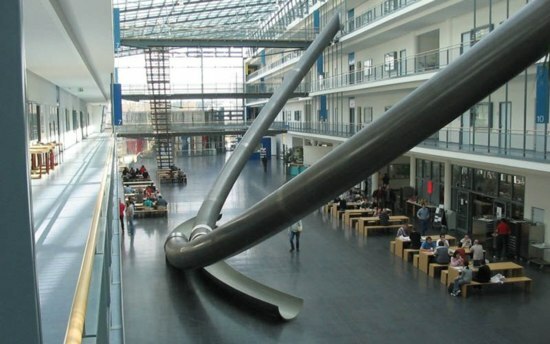 A university installed giant slides instead of stairs. 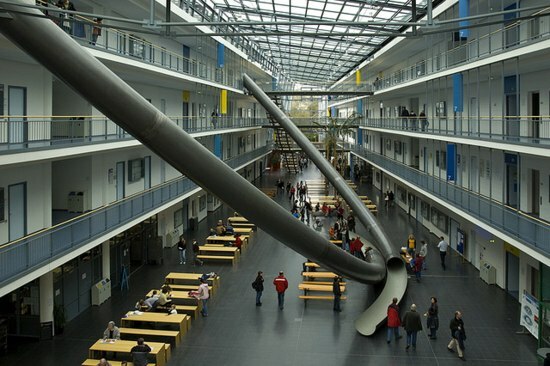 How fun would it be if the boring stairs and its exhausting efforts which prove more a physical exercise every time get replaced with fun slides for coming down from any floor to the ground floor in a ‘fast and furious’ manner, that too in your school or university? 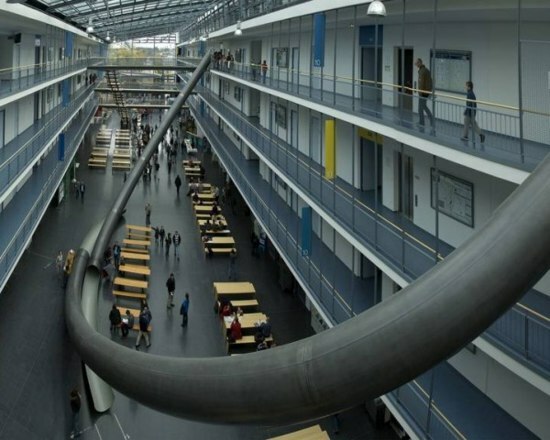 At the University of Munich, Germany, this is exactly how students commute via giant slides from any floor directly to the ground floor in an instant and super fun way! There are entry points to the slides on every floor with a final exit on the ground floor.The management argues that it puts the lives of students at ease. The basic idea behind this ‘futuristic phenomenon’ was to save the time as well as to provide a playful innovation. So of course, this gained good publicity. The more futuristic is the idea, the more simple it is. Students just sit on a mat with their books along with them and slide down from any floor to the ground floor! We can actually implement this too in our near future. It would be fun as well as a lot of time can eventually be saved by adopting this design. Undoubtedly, it won’t be a reason to be late! Previous articleEating Chocolate Before Studying And Or Taking Tests, Increases Your Chances Of Understanding Info And Passing With A High Grade. Next articleIn 2009, a 92-year-old Chinese Woman Named Huang Yijun Delivered a Child That She Had Been Carrying for Over Half a Century.